KIEV, Ukraine -- More than 13,000 Russian regular servicemen (three battalion combat teams) were deployed near the town of Ilovaisk, in Ukraine's Donetsk region, during August 2014. 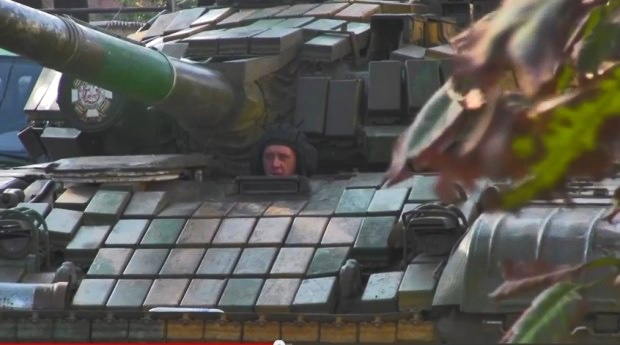 A Russian tank in Ukraine. Chief military prosecutor Anatoly Matios made public the information on January 27. "The battle for Ilovaisk was investigated. We carried out an extensive examination of the evidence with many experts. We came to the conclusion that three tactical combat teams comprising more that 13,000 (Russian) regular servicemen crossed Ukraine's border," Matios said. Matios earlier said over 15,000 Russian military troops and Russia-led militants were stationed near Ilovaisk in August 2014. A fierce fighting took place near Ilovaisk in late August 2014. Ukrainian troops were surrounded by combined Russian-separatist forces. The Russian-backed militants fired on convoy which headed through the corridor, which had been agreed with the enemy for withdrawal of the Ukrainian forces. Ukrainian troops suffered multiple casualties. The Ukrainian government described what happened at Ilovaysk as a massacre. According to official data, 366 troops were killed, while another 429 were wounded. However, a Ukrainian parliamentary commission estimates that up to 1,000 soldiers may have died in the Battle of Ilovaisk last year in August. "We are investigating, whether Ukraine, with all the military units available at that time was really capable of doing something against a direct hybrid-war invasion," Matios said.